Transporting the Future, Safely and Professionally! The Transportation Department of Cheney Public School is committed to transporting all students safely and professionally, to and from school and activities, in order to optimize the educational experience. In order for us to continue to ensure student safety, we will accommodate one pick up and one drop off address per student. Once again for this school year (2018/2019), all alternate destinations will require a bus pass from your child's school. In order to acquire a bus pass to another child's home both students will need a note from their parent / guardian involved and given to the school. Any note given to the school for an alternate destination must have the drop off address and phone number. Thank you for working closely with our drivers to better communicate changes in your child's pick up and drop off routine. Please keep in mind High School and Cheney Middle School students and Windsor and Westwood students must catch their own bus at their school of attendance. Students are not allowed to walk to another school to catch their bus. Transportation Department office hours: 6:00 a.m. to 5:00 p.m. on days when school is in session. The Transportation office is located just east of Cheney Middle School (across from their parking lot). We do require all riders to be at their bus stop 5 minutes prior to the assigned time, this is due to time fluctuation of weather, traffic and other variables. Have a safe place to wait for the bus, away from traffic and the street. 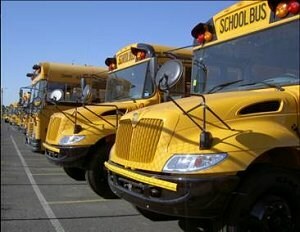 Students should arrive at their stop five minutes before scheduled pick up time. When being dropped off, students should exit the bus and walk ten giant steps away from the bus. If crossing the road after leaving the bus or in the morning crossing to get on the bus, always wait for the driver to signal you to cross. Keep a safe distance between you and the bus. Remember that the bus driver can see you best when you are away from the bus. Don't start to board the bus until the driver gives the signal that it's okay to approach the bus. Once you are on the bus, remain seated and follow the driver's directions. When the driver asks you to do something or to stop doing something, don't make a fuss or talk back. There's a good reason for it. Mind all traffic signals and/or the crossing guard. Never cross the street against a light, even if you don't see traffic coming. Always walk with a buddy whenever possible.